In celebration of “National Cut Your Energy Costs Day,” Klein Tools released additional insight from its “State of the Industry” survey. With input from more than 800 union and non-union electricians, survey results showed electricians have a growing interest in sustainable energy jobs in the electrical industry due to the opportunity to work on challenging systems and high-tech installations. The clean energy economy remains a large job creator, especially in the solar and wind energy sectors, and electricians want to be a part of this flourishing segment. 43% of electricians have seen an increase in the amount of work in sustainable energy projects, which includes jobs such as installing solar panels, developing wind energy solutions and working on complex automation and tracking systems. 83%of electricians who prefer sustainable energy jobs say they enjoy the opportunity to learn about challenging systems, according to survey results. 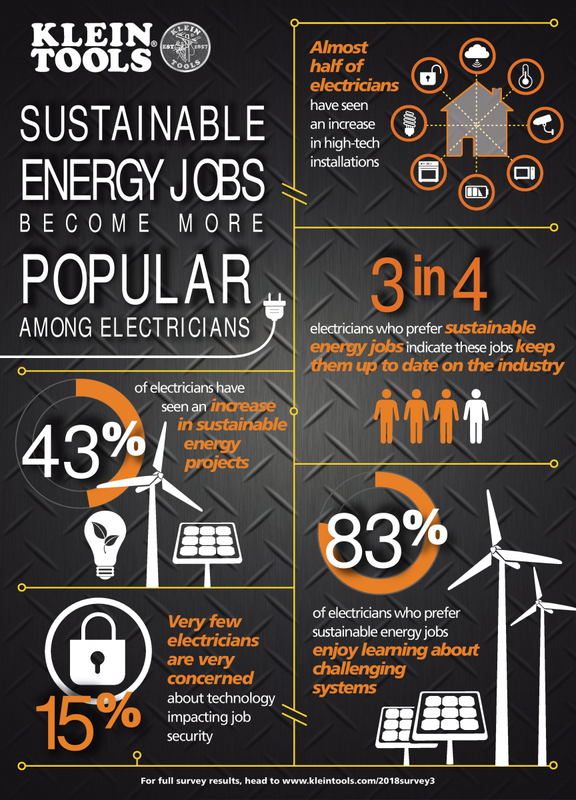 Additionally, 3 in 4 electricians who prefer working on sustainable energy jobs indicate these jobs allow them to stay up to date on industry changes and operations, and they enjoy the process of learning something new, applying it and seeing the results while using the newest, most efficient trends in the trades. The demand for electricians is rising year after year, due in part to renewable energy sources like sunlight, wind, tides, rain and geothermal heat. New demand and innovative technology applications make this segment energizing for electricians. Results confirmed that electricians like to work on high-tech jobs because they differ from other types of jobs, they offer stimulating tasks and are an exciting trend to be a part of. Almost half of the electricians have seen an increase in the amount of work in high-tech installations. Very few electricians are very concerned about technology impacting their job security. “More skilled workers will be needed as alternative energy jobs continue to drive our economy in the coming years. These projects require a mix of new and existing skills to commission updated systems that work with existing electrical networks. With the potential to create hundreds of new jobs in this sector, there is a bright future for electricians. It is more important than ever that we continue to recruit and train the next generation of skilled workers. It is vital that we work directly with students to showcase the many exciting opportunities available to them in the growing renewable energy industry,” adds Klein. More than 800 union and non-union electricians were surveyed for the Klein Tools “State of the Industry” survey by Russell Research, an independent survey research firm. Russell Research conducted 201 online interviews from Jan. 20-26, 2015; 200 online interviews from Jan. 27-Feb. 5, 2016; 200 online interviews from Jan. 10-18, 2017 and 200 online interviews from Feb. 2-14, 2018, to secure a nationally significant representation. Forty percent of respondents were union members and 60% were not.